The excavation at Dhaneti, located about 25 km south of Bhuj in Kutch, has thrown up a major surprise for researchers. Unlike conventional burial sites of Harappan era discovered so far, this mass burial site is not in the vicinity of any known human settlement. The site, dating back to 2900 to 2600 BC as per current estimates, is a departure from the convention that all burial sites of Harappan era are located near towns. The nearest Harappan site from Dhaneti is Kanmer located about 70 km away. 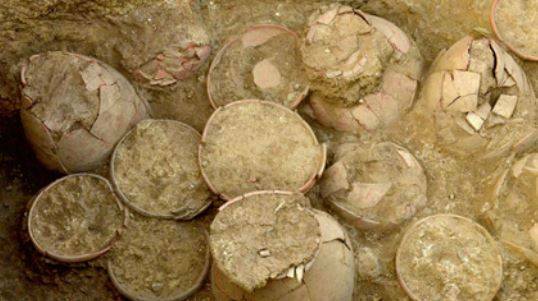 The earthen pots found from the spot are also different from the ones excavated from Harappan sites in Gujarat so far. The discovery was made by researchers from MS University in Vadodara in collaboration with the state archaeology department in January-February this year as part of ‘Dhaneti Archaeological Excavation and Documentation Project’. Dr P Ajith Prasad, MSU professor and project director, said that Dhaneti’s mass burial site is strikingly different from other Harappan sites as it’s cultural affiliation is obscured.